BC Transit route 61 stops at Whiffin Spit Rd and Sooke Rd. Check the listing for further details. Corporate parties and retreats welcome! We make it our goal to create the enchanted event that you envision, a magical occasion in which every detail is perfect. We help make the challenging process of planning a wedding or an event effortless. 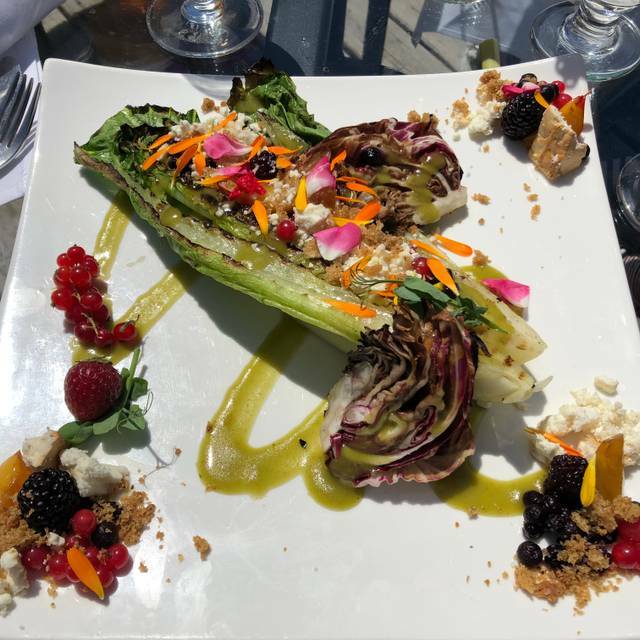 We have fine dining in our spectacular ocean front restaurant serving local, organic, seasonal, and wild food! Our gardens and grounds are an edible landscape with over 200 herbs, greens, flowers and vegetables. 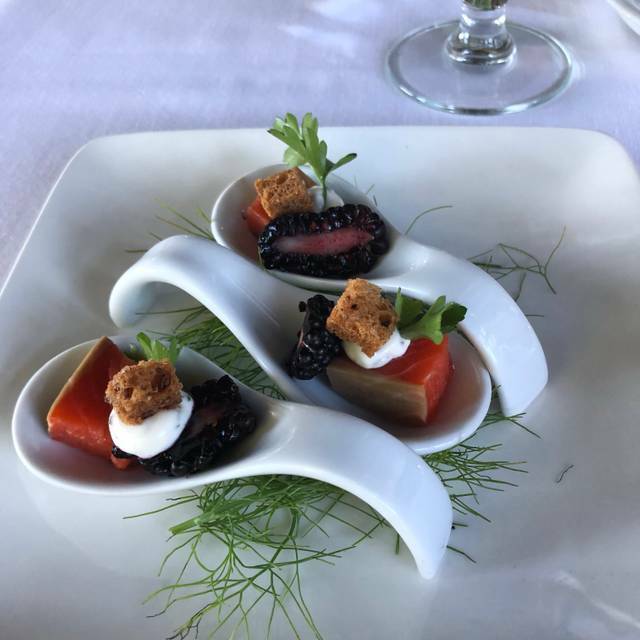 With Executive Chef Thomas Yesdresyski, we use the abundant natural resources of the area as a basis for fabulous cuisine, in an environment where people can get away from the stresses of the world and relax. Excellent!! Very diverse menu with lots of choices. Accommodated celiac needs very well! Service and ambiance were extraordinary! A friend referred us to this treasure! I had no expectation but a good meal. The facility is quiet and intimate; perfect for a romantic evening. The chef's tasting was superb; little tastes of many well prepared treats. The staff was attentive, pleasant and personable. Many thanks to everyone. In spite of it being a rainy night; the view was gorgeous. The deer prancing by was delightful. I cannot wait until my next visit to Victoria to return.......Karen, Portland, Oregon, USA. good, though the portions were small. The ambience with the view of the ocean is excellent and the service was good but the meal was overpriced at over $300. We had a better meal at a much lower price at Wild Mountain in Sooke two days later. I have been before and came away with the same feelings. Food always great but for the price the portions in the chefs tasting isn't enough to feed a hungry child. All it would take is 1 more piece of food in each coarse. I get the fine dinning and I do it fairly often but we still need to eat well not snack. The wine pairing was nice but 4oz wine for 45$ come on?? Unfortunately we won't be back and being new locals that's too bad for all of us, as we like eating out, has to be fair though. 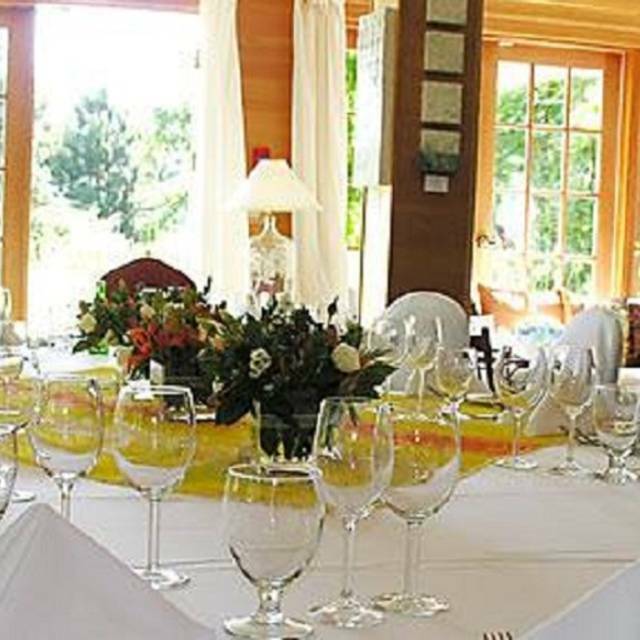 I would recommend to a friend only with me advising them that they will pay way to much for the amount of food and wine. Great location with an ocean and mountain view. The building needs some upgrading. The dining room had an unattractive grey-green carpet. I suspect there is a nice hardwood floor underneath it that would be much more elegant. The fixed price dinner was expensive given the very small portion sizes. The fish was excellent but the beef dish did not impress me. The quality of the meat was good but the sauce looked and tasted like Marmite or Bovril and extremely salty. I suspect it was actually one of the two mentioned. The wine list was very limited and the lady serving us the wine did not know the difference between an Italian prosecco and a Spanish cava. This did not impress our friends visiting from Madrid, Spain. A treat for all the senses. A west coast highlight. Decided to take myself out for a fancy dinner and was not disappointed. The staff were incredibly friendly and attentive, my meal was amazing (tip: get that carrot soufflé), and I enjoyed myself immensely. Thanks so much to the chef and staff for the wonderful experience! I'll definitely be back! Fabulous food! Exceptional service! Gorgeous ambience! Enough said. We were completely underwhelmed. Although the food was good, we both felt hungry as we left and for the substantial amount we paid for the meals, we’d have expected more food. With that said, the squid was exceptional and probably the biggest portion, while the main left me wanting more substance. Unique flavours and lovely balance overall, but I shouldn’t come home and need to raid the fridge to ensure I’m full. For the price point the service level needs to be increased, including a quality check. A recognition of my girlfriends birthday, which was mentioned in our reservation, would be the least to make a guest feel appreciated that we’d chosen your place of business to celebrate a momentous occasion. Visiting this place has been on my list of "special things to do" for decades. It was booked, online, from Alberta about a week before our visit. There was only one sitting on the day of our visit, at 18:30 hours, on a cool, rainy day. A couple of hours before the event we were called and advised that the dining room was closed for the evening, due to staff illness. However, we were able to arrange to be fed, with a similar menu, in the lounge. We had inky pasta (amuse bouche), mixed beet salad and rockfish for one main and venison tenderloin for the other. It was all very tasty and well prepared. We finished with a shared trio of homemade sorbets and coffee. The service was excellent throughout. Just prior to our visit we watched a solo otter swimming along the shoreline and scampering briefly on the gravel beach. Throughout our meal, though it was dark outside, the area was partially lit by a bright, large full moon which kept ducking behind the clouds. Disappointing service and food quality. Our visit to the Harbour House was in the low season after a week of snow. The roads were clear but the carpark was slushy with melting snow. 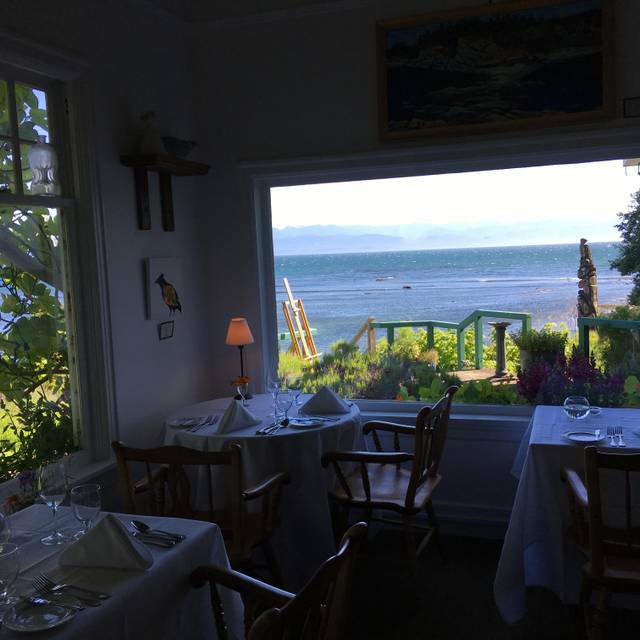 We were warmly greeted to a half-full restaurant and were guided to a good window table that overlooked Sooke harbour area. The maitre d' explained the menu carefully and we had drinks while we waited for the food. My soup followed by scallops was a good choice but my wife's quiche seemed over-cooked. A lady on an adjoining table advised us to avoid the oysters which she said were 'unpleasant'. Considering the cost of our lunch, on this occasion, we could not give full marks to value. Maybe things will improve in the summer. We have always loved the fine dining at Sooke Harbour House, so thought we would try their brunch in the Copper Room. Very different experience. Limited menu, less original than most Victoria brunch restaurants. Service was utterly indifferent and conspicuously slow. The food presentation was sub-par and the food itself mediocre. Several of the menu options were unavailable due, they explained, to the recent storms. Our server was unable -- even after going back to kitchen to check -- to identify the cheeses on the cheese plate we ordered. We will go back to SHH, but not for their brunch experience. This restaurant has some serious soul searching before they carry on! Food is good however; front of house and service lacks leadership. The chef should be embarrassed to know what is going on outside of the kitchen and whomever is manager or leadership role should immediately resign. If this restaurant has any chance of surviving they have alot of work. You can not ask top dollar with McDonald's service. Very disappointed. Good luck! Food was a tasting preset meal. Food was great resterant is very nice. We unfortunately got caught up in the middle of a co fused server who messed up the order of our dishes to be served and we got forgotten. After we missed 3 of our set6 dishes and ate our soup with a fork we complained. They promptly gave us a new server and caught us up and finished up the meal with success and professionalism. All ended well. We were last to leave and it was a 2.5 hour sitting. 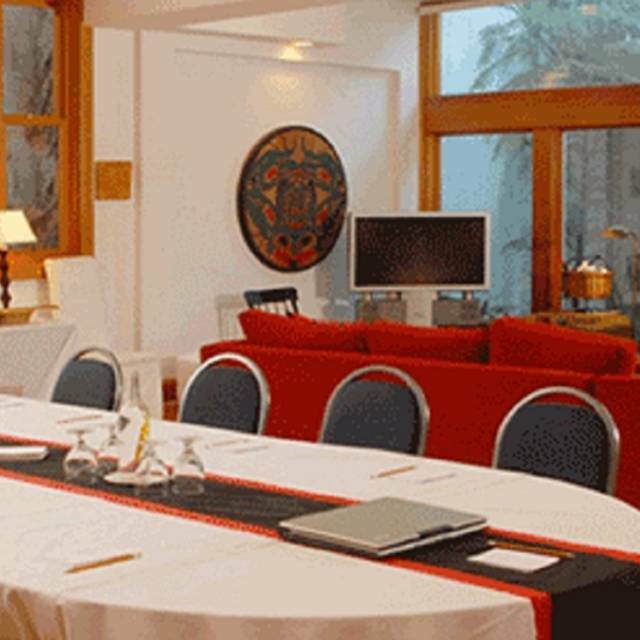 We were disappointed to be seated in the Copper Room at the hotel instead of in the dining room as that is where we made our reservation and it was a special occasion. The dining room was closed unfortunately. We ordered a 3 course dinner which ended up being 4 as they added an extra appetizer for us. That was very nice. Food was very good. Only small complaint was the steak was a little too rare for me, I left a large amount on the plate as I couldn't eat it. Everything else was awesome. We did the wine pairing as well and really enjoyed all the wines that were served. The above starred review was for January 1st. Breakfast. Our breakfast at Sooke Harbour House was delicious and arrived in very good time. To my surprise. We had some concerns about our reservation given our previous day’s experience. We had had lunch there the day before. Our waiter was friendly and funny. But our food took an inordinately long time to arrive. I would estimate we waited half an hour. It was soup, and a burger, for goodness sakes. Not haute cuisine. And the Copper Room was not full. And when it did arrive - it was just ok. Nothing special. 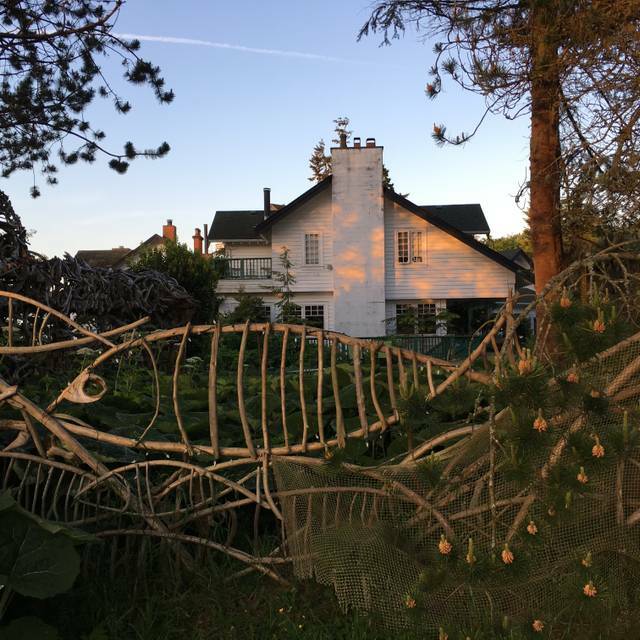 Definitely negatively affected my opinion of Sooke Harbour House. Very romantic and the food was excellent. The food was so good it’s the best I’ve had so far. We were at the Sooke Harbour House for brunch which had a rather limited menu. So I cannot comment on the regular fare. Our two dishes had too much salt in them and the individual ingredients did not seem to have a distinct and fresh taste. Not only was this a fabulous culinary experience, where the ingredients were super fresh and the concoctions, creative and delicious, but the atmosphere was also warm and inviting. We had the chef's tasting menu and while the food itself was stellar it was quite a while between being seated and even seeing a wine list let alone being able to order anything. The drink in particular is overpriced. It's the only place we've been where dinner cost more than the room! (Note we were there in the off season.) Unless you just happen to be out in Sooke, it's a long ways to go just for dinner. Came from California to dine on 10/16. Great experience on two previous occasions. We were not told fine dining closed on Tuesdays when making reservation. Very disappointed after long drive from Victoria. It took 2 hours to to conclude dinner. Waiter was kind enough to waive charges. Overall, not a good experience. 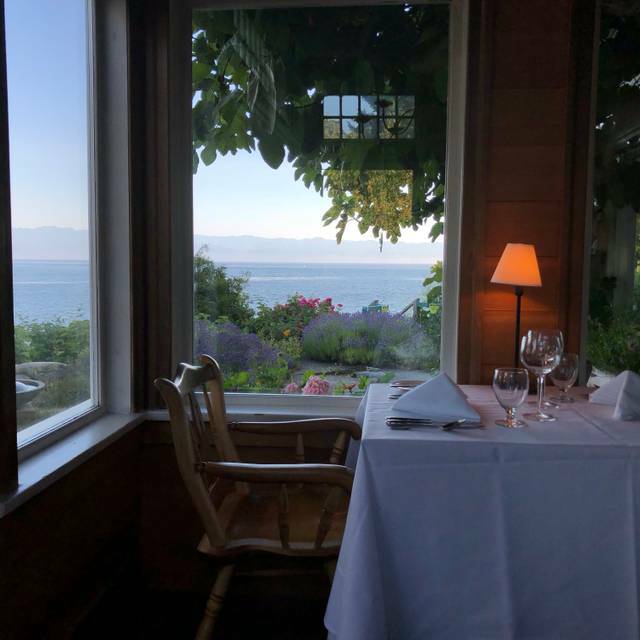 From the decor with original local artworks to the view of the ocean to the exquisitely presented scrumptious food, this was a wonderful dining experience. The service was friendly and flawless and the price was very reasonable for the quality. 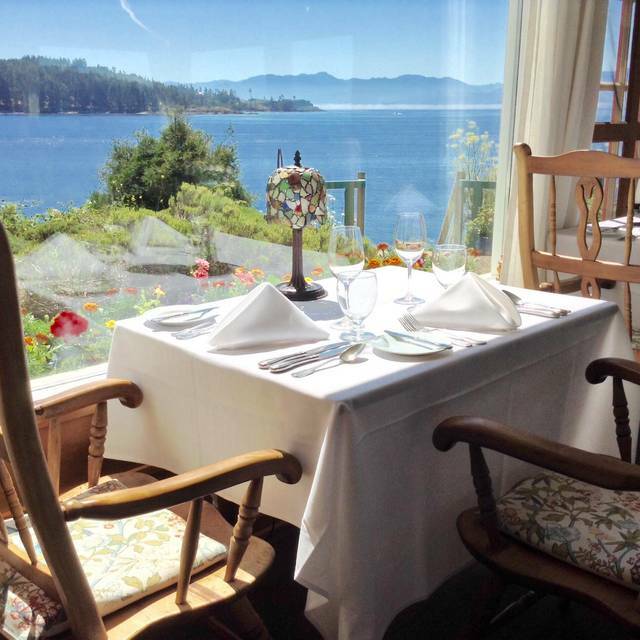 The Sooke Harbour House must be one of the best places to celebrate a special meal in all of North America. The dining room was full of smoke from the fireplace! The maître de - Jess - was rushed and disorganized. Georgeous Inn. Pretty location. Beautiful water views. Great food. Wonderful service. Fun to watch the little deer foraging. It was my husband’s birthday dinner & the meal totally supported the special occasion! It was a quiet night (Tuesday) in the restaurant but the servers were both so patient & never made us feel rushed! We did the wine pairings & we like be the fact they promote BC wines. Every course was delicious, creative & so beautifully presented! We can’t wait to go back!!!! Beautiful scenery, lovely garden, food just ok. I would like to try the dining room as it looked lovely. The food items were super fresh and the flavours interesting and delicate/subtle. Unfortunately, a noisy group made conversation at our table difficult and conversation was one of the objectives of this lunch. I will be back. 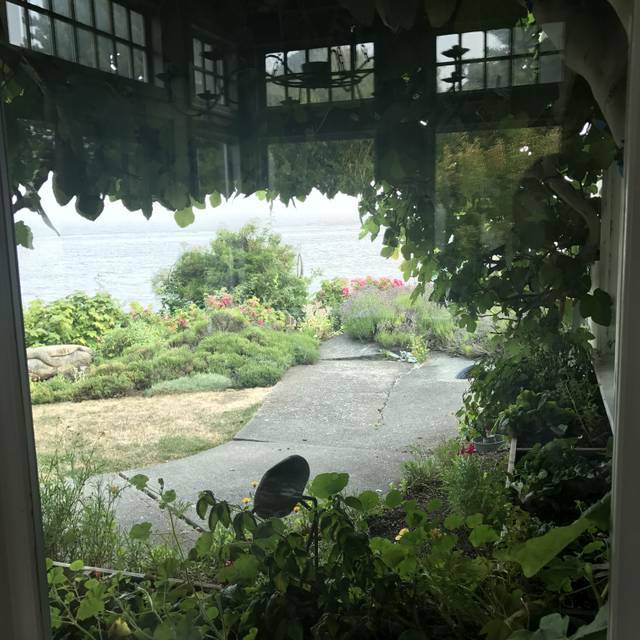 We enjoyed the lovely setting of the Sooke Harbour House. Views from the dining room were surpassed only by the excellent food and attentive service. Will definitely dine there again! I have been here several times and they are yet to disappoint. Only reason I didn't give 5 stars is because when I did the wine pairing one of the glasses had a large noticable crack that should of never made it to my table. It was rectified very quickly how ever. Also there was a crawling insect on one of the side plates that was also dealt with fast when commented on. Amazing food and surprising service for a restaurant of this caliber. Food was outstanding, service forgot things and got drink orders mixed. Even the bill wasn’t correct. All things considered, we would still go back!! Took my parents for a last night special night our before they returned to home to the UK. $75 a head for 3 courses - we left feeling hungry. The quality of the food was very good, but overall it felt more than a little pretentious - eg. "Locally Foraged Apple Crumble", and too many flowers in the food. The steak my Dad ordered must have been 3-4 oz. Service was slow despite it being quite quiet. Not worth the hype or the expense unfortunately. Also surprised that, despite there being crab shells everywhere in the restaurant, there was no crab on the menu. Always a fabulous experience - outstanding food, views and service. Top of our list for a splurge night out! The food was great and the view was lovely but we felt that the copper room next door might have been a better spot in terms of popularity. A little expensive but as to be expected of course. Overall glad we tried it but probably won't be back. Nice location and atmosphere. Service was good. Menu was good but way to pricey. Would not return on account of price. First- the food was DELICIOUS!!! If you are looking for an amazing meal and are able to leave your expectations for good services and a great experience at the door- you will be very happy! Our dinner started out by the waitress spilling our first wine pairing all over my husband- innocent mistake for sure, we could have easily gotten past that, but then.. part of my main course was missing and rather than taking the plate away and brining me a new one that was correct, the waitress brought me out a tiny bowl of gnocchi and mushrooms to add to my meal. Then the waitress forgot what our dessert course was (we know this because she offered us a dessert menu even though we had already ordered it) and instead of admitting her mistake she sent another waitress over to ask how or meal was and if we decided to go with the fourth dessert course, what we ordered, and if we had the wine pairing with it. We would have had much more respect if she had just admitted that she forgot what we ordered. When dessert came, we got to enjoy it while listening to two employees at the table behind us talking about switching shifts and having to work too much- lovely. Finally, when we went to go pay the waitress (who spilled the wine on my husband and who was sent over to "casually" inquire about dessert) acted like she had no idea why we would have been disappointed- I don't know about you, but when I go to Boston Pizza and any of the above happens- they at the very least offer to compensate SOMETHING. Be prepared that this meal is $300+, for that price, we were VERY disappointed in what was supposed to be our celebratory Honeymoon meal. August, 18, 2018.